Finding healthy party ideas isn’t easy. Most of the time, when I’m invited to a party, the snacks include cake, cupcakes, and chips. While I enjoy the occasional sweet treat, I really enjoy when the hostess has thought of a few healthy party ideas to include as well. This Winnie the Pooh Party has mostly healthy snacks with just one sweet treat to enjoy. These suggestions for healthy party ideas for a Winnie the Pooh party are fairly simple. You can do as many or as few of them as you want to depending on the ages of your guests and the number of people coming to the party. Here are a few Winnie the Pooh birthday party ideas for your menu. 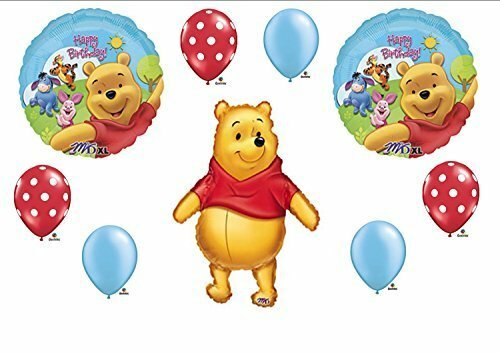 Don’t forget to pick up some Winnie the Pooh birthday supplies. Here are a few gluten free party ideas if you have to deal with gluten intolerance. You may want to check out my Peter Pan Birthday Party ideas. 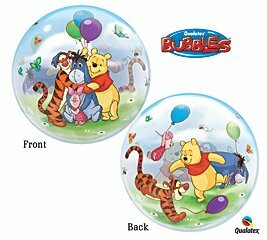 Tablecloths, napkins, and plates in white, yellow or red will match Winnie the Pooh’s colors. If you have any Winnie the Pooh and Friends stuffed animals, they can be used to decorate as well. While you don’t need to dress up, making these easy DIY custom Winnie the Pooh shirts would be fun. Make this cute party favor out of clothes pins and baggies filled with cereal like Cheerios, Honeycomb or Corn Pops. You can let the kids make these themselves and have them use markers to avoid drying time. There are so many cute Winnie the Pooh videos that would work for a Winnie the Pooh Party. My favorite is the original classic The Many Adventures of Winnie the Pooh. The original classic The Many Adventures of Winnie the Pooh is the first Winnie the Pooh movie I watched. You will see the first time that Pooh and Tigger meet when Tigger pounces Pooh. You’ll watch Eeyore float down the stream on his back (one of my personal favorites) and all of your favorite Winnie the Pooh moments. Disney Intermission – Press pause during the movie and find out what happens. The narrator invites younger viewers to play along with the Hundred Acre Wood friends in a variety of engaging activities. Pooh Play Along – A bonus adventure where you can play along with Pooh and his friends. The Blu-ray and HD Digital pack includes an exclusive free in pack kite to play with. Winnie the Pooh is one of my very favorite Disney family of characters. I can identify with just about all of them from the practical Rabbit to the timid Piglet and the melancholy Eeyore although I admit that my kids remind me more of Tigger than I do. This Winnie the Pooh movie is by far my favorite and is great entertainment for a Winnie the Pooh Party. If you like this post on healthy party ideas for a Winnie the Pooh party, follow my Party Ideas board on Pinterest for more ideas. I love the Haycorn cookies as well as the whole theme. omg. the haycorn cookies <3 so cute!! Oh my goodness, where do I start... everything is beyond Adorable. I love this. I think the "Piglets Pig in a Blanket is so cute - I would have to say my favorite are the Haycorn Cookies. This is such a good idea for a party and not filling the kids up with junk food. This is such a great idea! Those acorns are so unique! I may have to try this themed party! Very cute ideas! I like the hay-corn cookies! what did you use to make the haycorn cookies? I used a mini Nabisco Nutter Butter cookie, spread with peanut butter on one side & then a Hershey's Kiss on that.